OCTOBER 1. 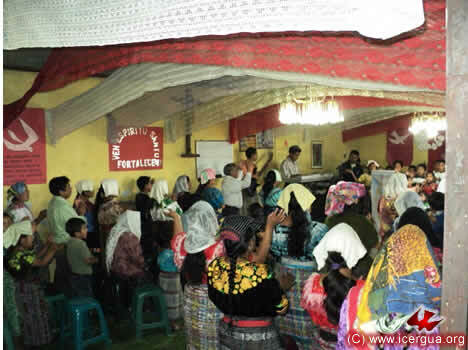 CELEBRATION WITH THE PENTECOSTÉS COMMUNITY OF SANTIAGO ATITLÁN. 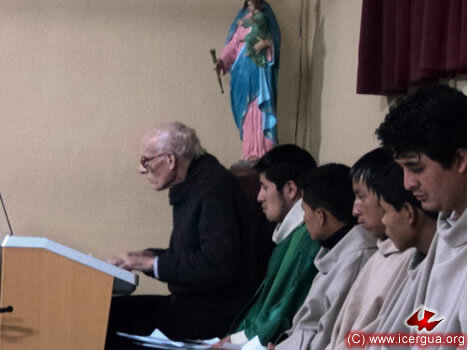 On the first of October Monsignor Eduardo began the month’s missionary activity with the Pentecostés Community of Santiago Atitlán. In the photograph at left: The bishop with the members of the music ministry and the community’s chorus. Right: The bishop giving Absolution to Brother Gaspar. He is one of the four communion ministers in the community. OCTOBER 1. VISIT TO THE EFUSIÓN DEL ESPÍRITU SANTO COMMUNITY, SANTIAGO ATITLÁN. 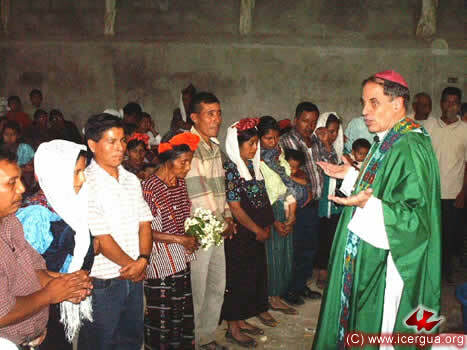 At dusk Monsignor Eduardo visited the Efusión del Espíritu Santo Community in Santiago Atitlán. 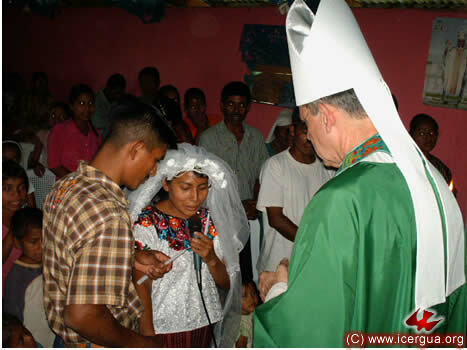 The visit provided the opportunity for a couple to marry and several children to receive Christian Initiation. The community was very excited, and the sustained growth that it is experiencing was readily visible. 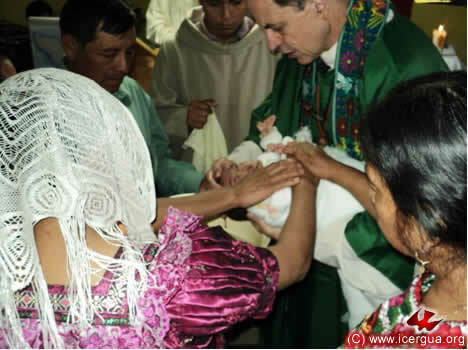 Right: The bishop holding one of the children that is to be baptized while the parents and sponsors with hands extended invoke the outpouring of the Holy Spirit. Left: The couple having exchanged matrimonial consent and the outpouring of the Holy Spirit having been invoked that the union of the pair may be lifted to sacramentality, the parents and sponsors pray devoutly over the couple asking for them a life of holiness and perseverance in their commitments. OCTOBER 2. 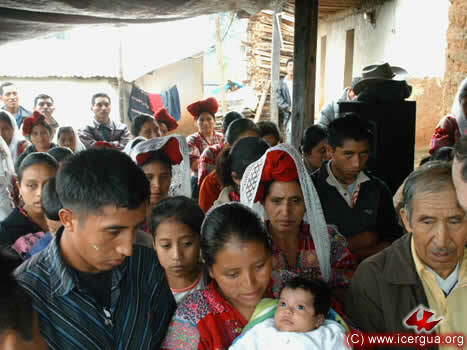 COVENANT WITH THE XENAXICUL COMMUNITY, AGUACATÁN, HUEHUETENANGO. 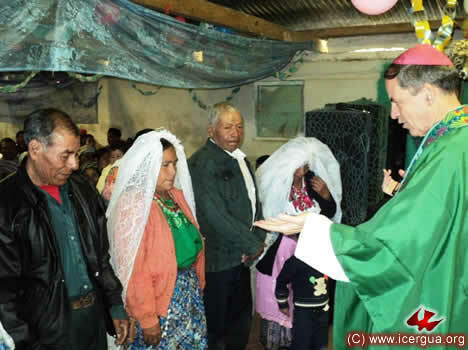 On Saturday, October 2, in spite of the severe problems brought on by the rains that had closed the road from Huehuetenango to Aguacatán, our bishop made his first visit to the Xenaxicul Community. This is a Quiché-speaking community that had joined and made a covenant with ICERGUA. It has five hundred members. 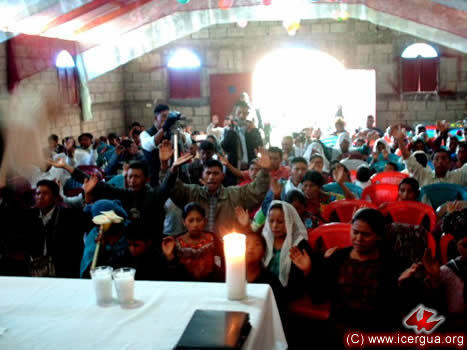 During the visit, the church building they had just finished was blessed. The ceremony was carefully prepared. 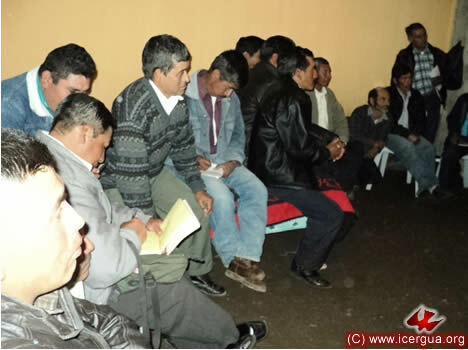 The community radio station of the municipality of Sacapula, El Quiché, broadcast the ceremony. Above: The bishop sprinkling with water the entire exterior of the church before going inside and doing the same for the interior. Left: The faithful with repentant hearts making the confession of their sins. The visit provided the opportunity for many baptisms and several first communions. Right: Some of those who are making their first communion preparing to receive the Sacrament. OCTOBER 2. 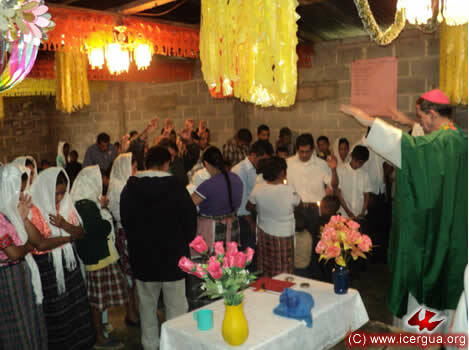 EUCHARIST WITH THE COMMUNITY OF CENTRAL SANTIAGO CHIMALTENANGO, HUEHUETENANGO. 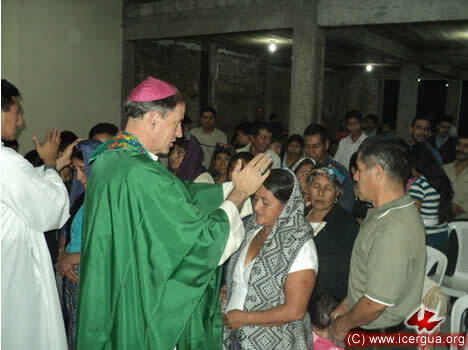 On the afternoon of October 2, our bishop visited the Santiago Chimaltenango Community in Huehuetenango. This community has experienced powerful growth recently. Having purchased a parcel of land, it will soon begin the construction of its church. In addition to the Eucharistic celebration, the bishop’s visit provided the opportunity for conferring the sacraments of Christian Initiation for several young people. OCTOBER 2. 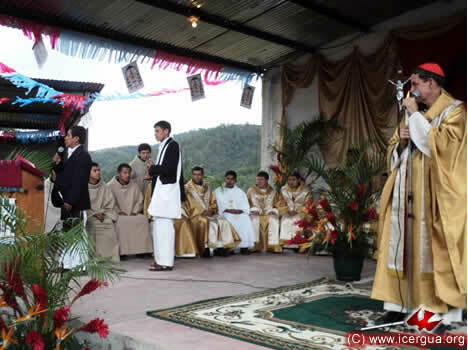 BAPTISMS AND EUCHARIST IN BUENA VISTA, SAN PEDRO NECTA, HUEHUETENANGO. 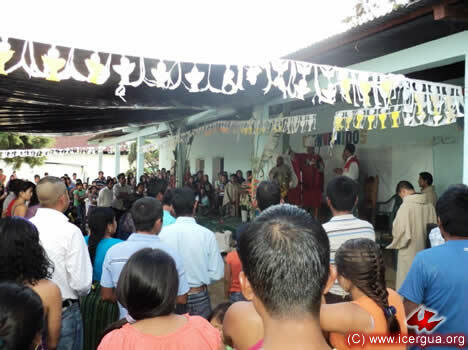 During the evening of October 2, Monsignor Eduardo visited the Buena Vista Community, San Pedro Necta, Huehuetenango. Through the years this community has been characterized by its joy and missionary spirit. Several of its members have felt called to form new communities in different places and have been abundantly blessed. Part of the ceremony was to baptize several children, as in the photograph at right. OCTOBER 3. CELEBRATION WITH THE PAJALES COMMUNITY, SAN ANTONIO HUISTA, HUEHUETENANGO. 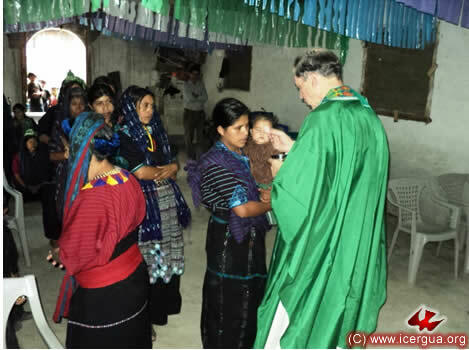 On Sunday, October 3, Monsignor Eduardo visited the Pajales Community of San Antonio Huista, Huehuetenango. This community has grown more and more rapidly in recent times. In fact many of the faithful from other churches, on seeing the seriousness, mutual respect and liberty with which members work in our church, have felt called to join us. 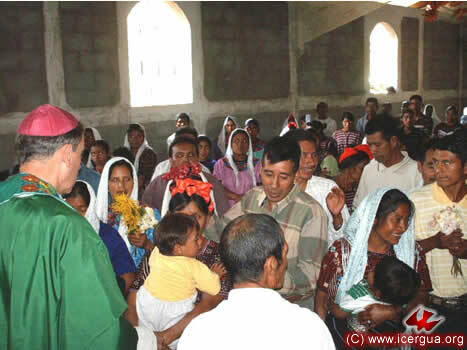 The visit was the occasion to celebrate complete Christian Initiation for one of those entering into marriage. 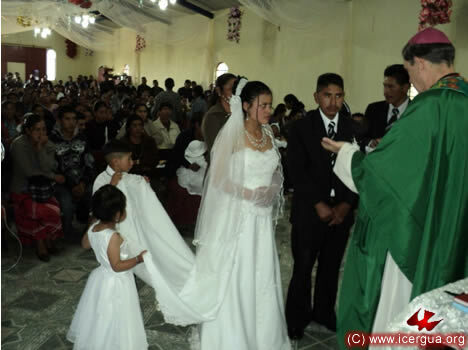 Right: The couple who married presenting their children that they may receive the sacraments of Christian Initiation. Left: The couple, having expressed their consent to marriage, exchange rings as a sign of their eternal love and faithfulness. OCTOBER 3. VISIT TO THE SANTO DOMINGO COMMUNITY, LA LIBERTAD, HUEHUETENANGO. 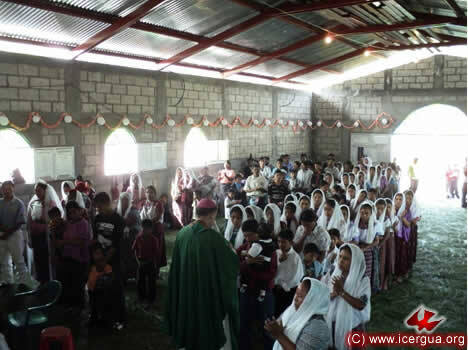 Towards midday on October 3, Monsignor Eduardo visited the Santo Domingo Community in La Libertad, Huehuetenango. Under the coordination of Brother Juan, who also works on the regional level, the community has been consolidating. 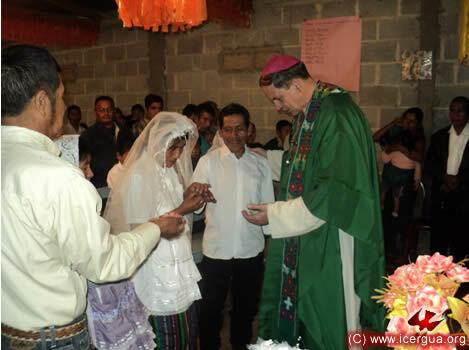 During the bishop’s visit, the marriage of a couple and Christian Initiation for several young people were celebrated. Right: The marrying couple giving their free consent to be faithful to one another and love each other throughout their lives. OCTOBER 3. 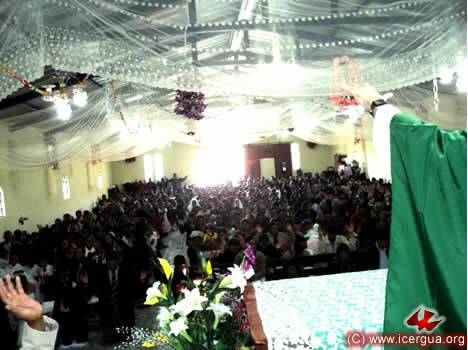 EUCHARIST IN SAN JOSÉ IXCUNÉN, LA DEMOCRACIA, HUEHUETENANGO. 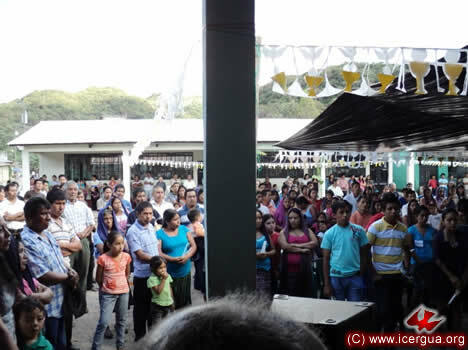 In the afternoon our bishop visited the San José Ixcunén Community in La Democracia, Hueheutennago. Several baptisms were celebrated. Most touching was that eight couples, who had joined our church along with the community a few months ago, decided that to reaffirm their membership they wanted to receive Chrism. Chrism took place after many children had received Christian Initiation. The members committed themselves to being faithful to the Church and to work untiringly in giving witness to the Gospel. Above: At the beginning of the celebration, the faithful making the confession of their sins. Right: The faithful preparing for the celebration of the rites of Christian Initiation for fifteen children. Left: The couples who received Chrism expressing their commitment to be apostles and witnesses to the Gospel, before the sacrament was administered to them. OCTOBER 9. 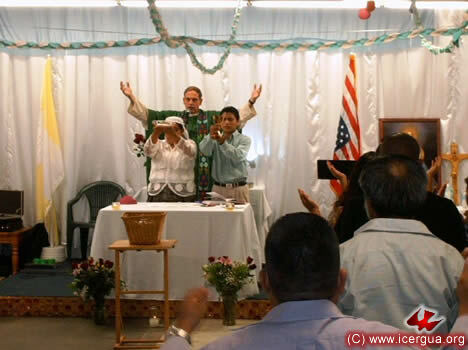 EUCHARIST IN THE SAN MIGUEL ARCÁNGEL PARISH, LOS ANGELES, CALIFORNIA. On Saturday afternoon, October 9, Monsignor Eduardo celebrated Eucharist in the San Miguel Arcángel parish center, Los Angeles, California. About two hundred faithful, originally from Nucá, Santa Cruz Barillas, Huehuetenango, were present. Two children, who had been carefully prepared, made their solemn communion during the celebration. The parish community, which moved into its new center during September, is very excited and is experiencing outstanding growth. Above and right: The Homily. In the lower left corner of the photograph at right is a girl who made her solemn communion. Left: Two communion ministers raising the bread and chalice, symbolizing that each member of the community is offering him- or herself as a living sacrifice to the Father. OCTOBER 9. VISIT TO THE PACTO DIVINO COMMUNITY, LOS ANGELES, CALIFORNIA. 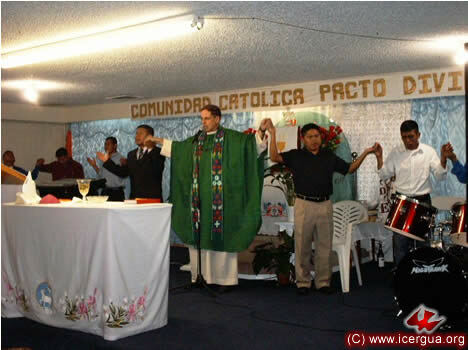 In the evening our bishop presided at the celebration with the Pacto Divino Community. This community went through some difficult times recently, but now it is in a phase of restructuring and growth. It is encouraging to see that in spite of the difficulties, the faithful have stayed firm and now are receiving the fruits of their perseverance. Above: Some of the brothers receiving Absolution after making their confession of sins. OCTOBER 10. 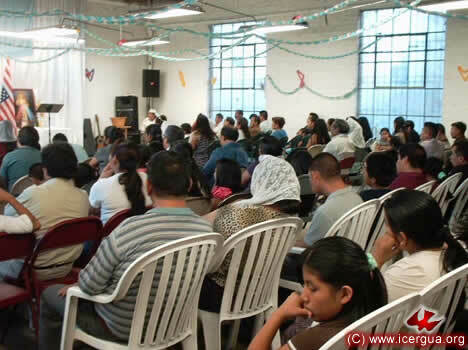 ESTYMLA AND EUCHARIST IN THE EL PESCADOR MINISTRY, LOS ANGELES, CALIFORNIA. Above: The class in session. Right: One of the servers reading the second lesson while, in the back, one of the communion ministers is preparing the Eucharistic celebration. OCTOBER 15. 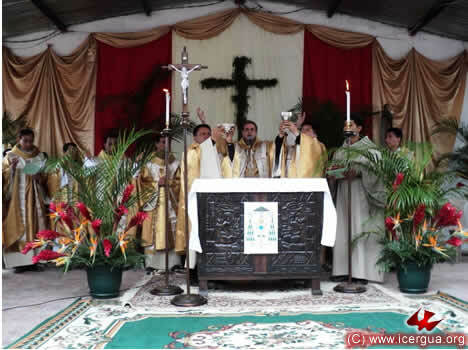 EUCHARIST IN TZUNUNÁ, SANTA CRUZ LA LAGUNA, SOLOLÁ. 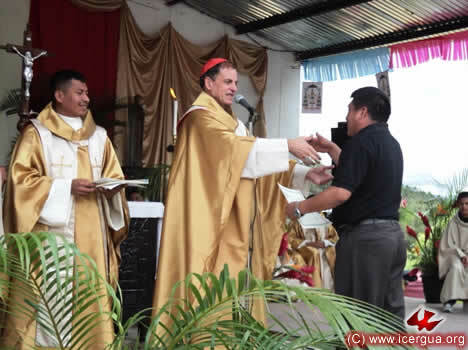 On Friday afternoon, October 15, the bishop crossed Lake Atitlán to Tzununá to celebrate the Eucharist with the Renewed Catholic Community there. The situation around the lake is unusual in two ways: the lake has risen by two meters, and the bad harvests and slack tourism have brought economic troubles. The members of our communities, however, continue not to be discouraged and are trying to be signs of hope in the midst of uncertainties. Above: A view of the dock on the arrival at Tzununá. 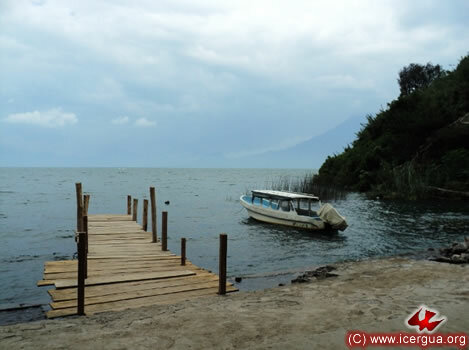 During the rainy season the dock had to be rebuilt each of the five times when the rising lake overflowed the previous dock. Right: The parishioners participating in the Eucharist come forward to take communion. OCTOBER 15. VISIT TO THE JAIBALITO COMMUNITY, SANTA CRUZ LA LAGUNA, SOLOLÁ. 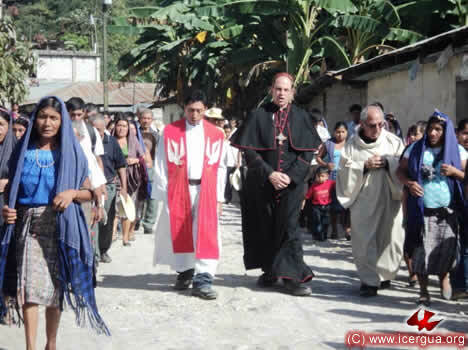 On the afternoon of the same day, our bishop visited the Jaibalito Community. This community was badly hit by hurricane Agatha. Several Renewed Catholic families are still living in improvised sheds, for their dwellings were along side of the torrential rivers from the mountain. Nevertheless, the faithful are full of hope and have progressed considerably in becoming stable and better prepared for the liturgical and communitarian life. 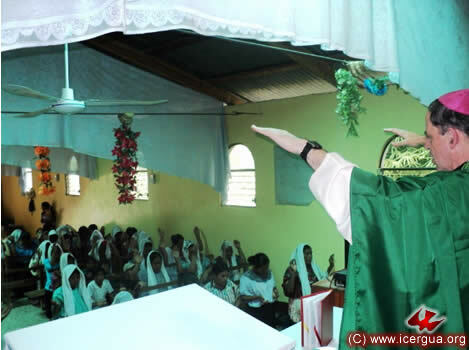 Above: Monsignor Eduardo exhorting the People of God at the beginning of the Eucharist. Right: Some of the faithful coming forward to receive absolution for their sins, having made their humble confession. OCTOBER 16. 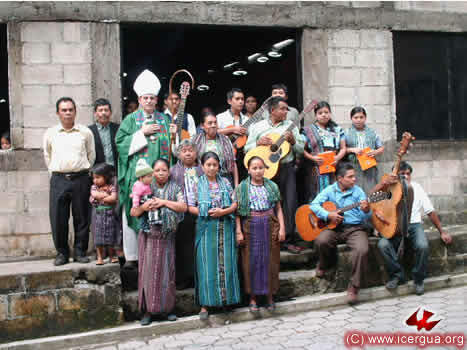 CELEBRATION IN THE LA ESPERANZA COMMUNITY, UNIÓN CANTINIL, HUEHUETENANGO. 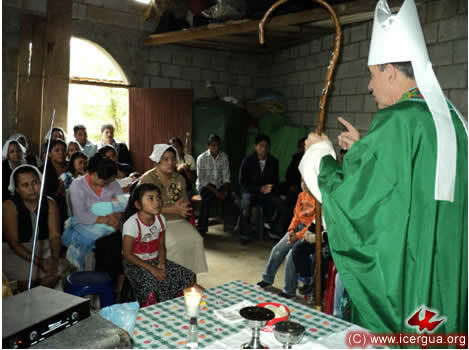 On Saturday, October 16, Monsignor Eduardo began his pastoral activity by visiting the La Esperanza Community in the municipality of Unión Cantinil, Huehuetenango. The celebration was held in temporary premises. However, the faithful are very happy because they have bought a beautiful piece of land and expect to begin construction of a church building very soon. Above: Participants in the Reconciliation making their humble confession of sins. Right: The homily. The People’s attitude on hearing the Word of God is striking. Most importantly, their disposition to serve the faithful is deeply admirable. OCTOBER 16. 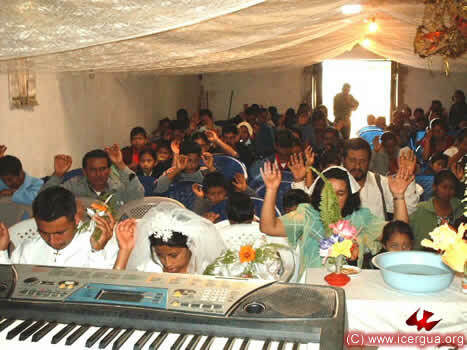 BAPTISMS, CHRISMS AND MARRIAGES IN LA NUEVA ESPERANZA, LA DEMOCRACIA, HUEHUE. 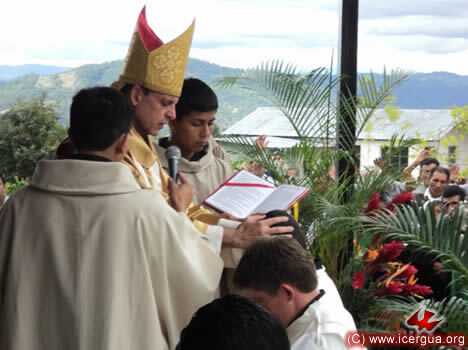 On the afternoon the October 16, Monsignor Eduardo presided at the Eucharist with the La Nueva Esperanza Community, in the municipality of La Democracia. 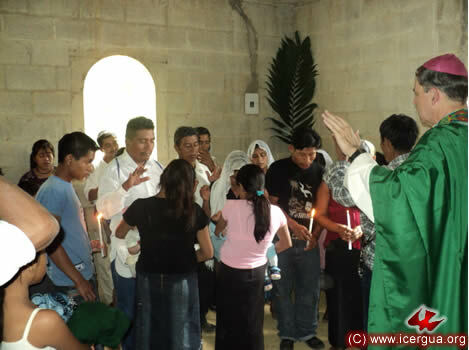 The visit was the opportunity for several children and young people to be baptized and participate in communion. Above: The People of God asking God for the forgiveness of their sins through the outpouring of the Holy Spirit. 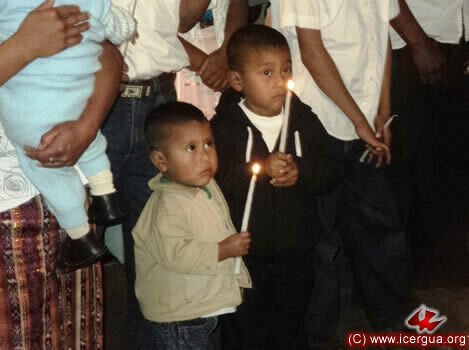 Right: Washington and Berchman —two of the children who experienced the celebration of the sacraments of Christian Initiation— listening intently to the bishop’s exhortation to the parents and sponsors. Left: Cirilo and Catarina, after expressing mutual consent to marry each other, exchange rings as a pledge of the fidelity, care and love that each will have for the other. OCTOBER 16. CONCLUSION OF STUDIES AT ESTYMLA, HUEHUETENANGO. On the evening of October 16, our bishop was invited to have supper with the teachers and students of ESTYMLA, whose courses of study were ending. Eight members completed the third year, receiving a Diploma in Basic Theology. Six completed the second year, receiving a Diploma in Catechesis and Liturgy. The teachers this year were seminarians Pedro Martínez (who will be ordained a presbyter on October 29), Orlando López and Bernardo Vásquez. Left: The second- and third-year students and some of those who helped with the cooking and cleaning. Many of the faithful who completed the third year have expressed a desire to continue next year to deepen the formation they have received so far. Right: The eight brothers who completed the third year and received the Diploma in Basic Theology. OCTOBER 17. 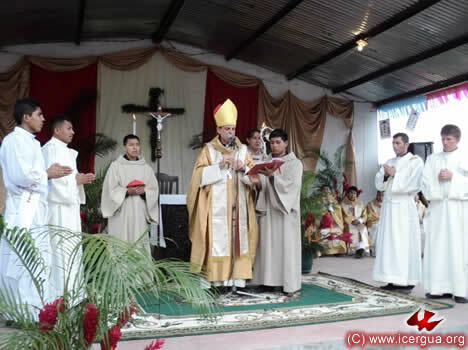 MASS IN ICAL, COLOTENANGO, HUEHUETENANGO. 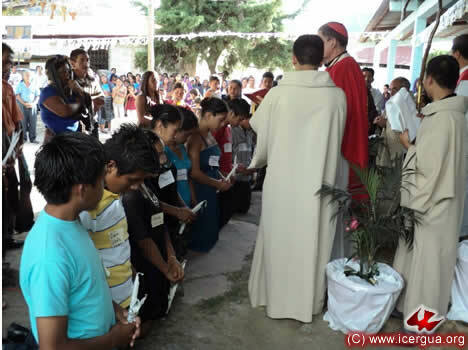 On Sunday morning, October 17, Monsignor Eduardo visited the Ical Community in Colotenango. 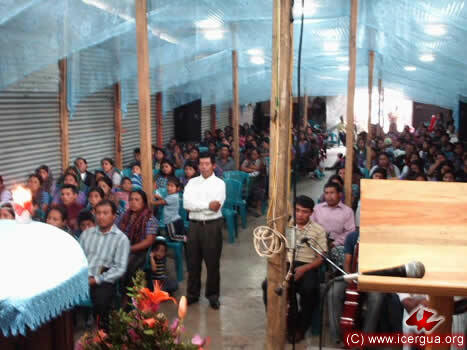 It is his second visit, for the community made its covenant with ICERGUA less than two months ago. 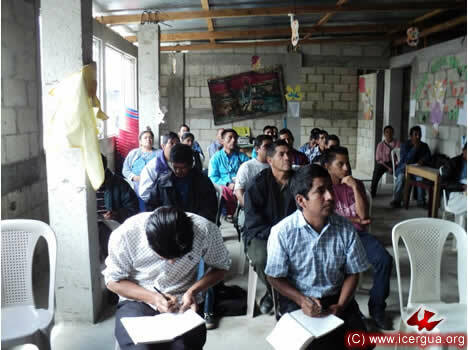 The faithful are excited and taking training in evangelism. Above: The community’s music ministry, which enlivens various celebrations with its marimba playing. Right: Some of the faithful, having made confession, coming forward to receive Absolution. OCTOBER 17. 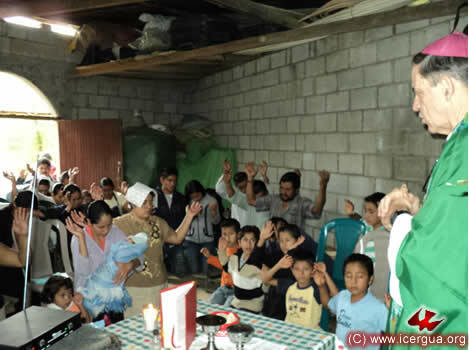 BAPTISMS AND EUCHARIST IN SAN ISIDRO, LA LIBERTAD, HUEHUETENANGO. 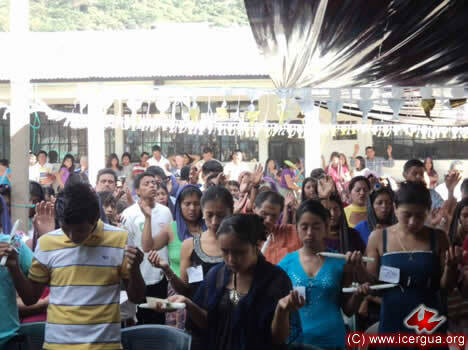 Later in the same morning, our bishop visited the San Isidro Community in Libertad. This community has taken huge strides in the past few months. Four families have joined, and now the members of the community are making plans to build a house of prayer. 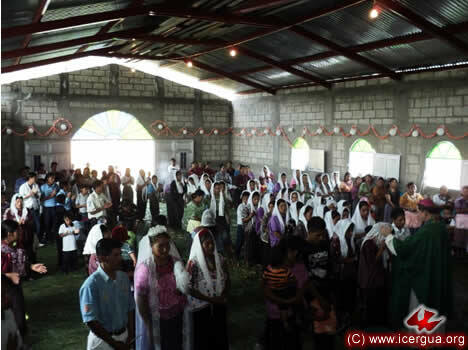 Some neighboring communities are in dialogue with them about the possibility of also making a covenant with and entering into ICERGUA. Above: The prayer of petition, the response to the reading of the Holy Scripture. 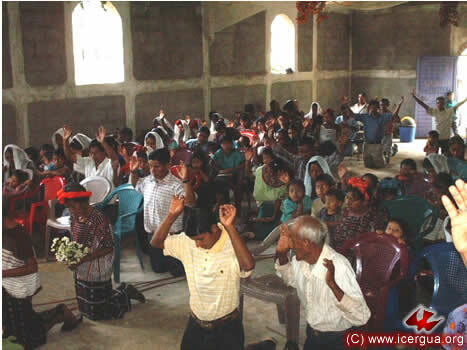 Right: The sponsors praying over the children who had just been baptized. OCTOBER 17. VISIT TO THE LA VEGA COMMUNITY, LA DEMOCRACIA, HUEHUETENANGO. 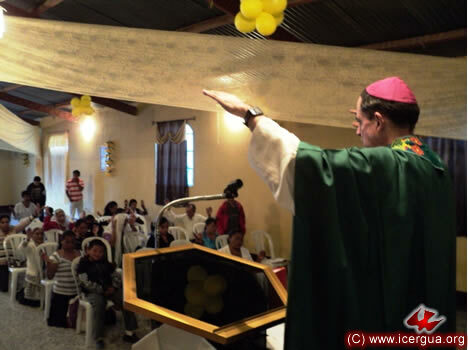 During the afternoon of October 17, Monsignor Eduardo visited the La Vega Community, La Democracia, Huehuetenango. The community received the bishop with great joy and renewed its promise to work fervently in missionary activity. Above: The bishop invoking the outpouring of the Holy Spirit on those who have confessed their sin, that they may be pardoned. Right: The faithful coming forward to receive Absolution for their sins. OCTOBER 21. CONCERTS IN THE SEMINARY. Our Seminary has been blessed with a new organ for liturgical use. David Greene, a friend of the Seminary, served with Monsignor Eduardo and Padre Juan Moisés on the committee that selected a Yamaha organ with excellent features and tone. It will help us to sing the Offices and Masses with greater depth and care. To celebrate this event, Doctor Greene gave three short concerts on Thursdays October 7, 14, and 21 prior to the evening celebration of the Eucharist. Dr. Greene has a doctorate in theology, specializing in sacred music, and is Professor Emeritus at North Carolina State University in the United States. He teaches English and Sacred Music in our seminary. In the concerts he played music of Bach, Mozart, Brahms and Franck. Above: The chapel and those attending the last concert. Right: The Rev. Dr. Greene during the concert. OCTOBER 22. 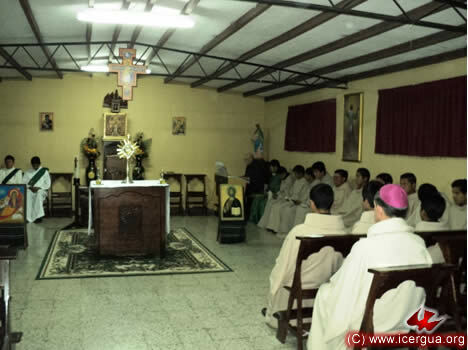 MEETING OF THE SANTA MARÍA CHIQUIMULA PASTORAL COUNCIL. On Friday afternoon, October 22, our bishop had an informal meeting with some of the members of the Pastoral Council of Santa María Chiquimula to reach closure on several questions having to do with the Council’s consolidation. The goal now is for the council to organize itself so that in the near future a Renewed Catholic parish can be formed in this municipality. OCTOBER 22. VISIT TO THE CENTRAL SANTA MARÍA CHIQUIMULA COMMUNITY, TOTONICAPÁN. 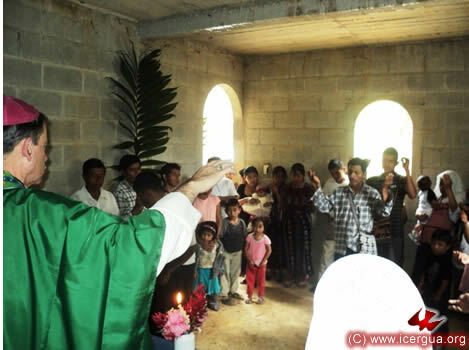 Also during the afternoon of October 22, Monsignor Eduardo visited one of the two Renewed Catholic communities in the center of the municipality of Santa María Chiquimula. Before the Eucharistic and baptismal celebrations began, the community’s children choir sang a series of enlivening songs. It was beautiful to see the way the faithful had succeeded in involving the children actively in the life of the community. An important aspect of the celebration was the administration of the sacraments of Christian Initiation for several young people and children who were being incorporated into the community. OCTOBER 23. 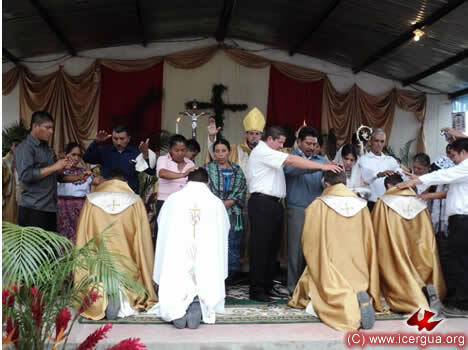 EUCHARIST, BAPTISMS AND MARRIAGES IN CONCEPCIÓN TUTUAPA, SAN MARCOS. 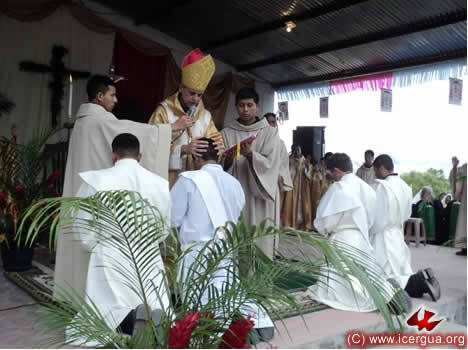 On Saturday morning, October 23, the bishop visited the Renewed Catholic Community of Tictúcabe, Concepción Tutuapa, San Marcos. One could see that after years of work, sometimes marked with serious difficulties, the community is experiencing consolidation and growth. 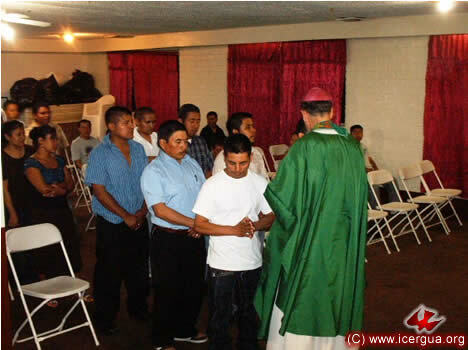 The visit afforded the opportunity to administer the sacraments of Christian Initiation for several of the faithful. Others received Chrism and two couples celebrated their marriage. Above: Intense prayer during the celebration. Right: The bishop asking the couples who are marrying about their intents, consent and promises. Left: The two couples who married and the community leader, brother Armando Ramos, along with the bishop after the Eucharistic celebration. OCTOBER 23. CELEBRATION IN CHINACÁ, HUEHUETENANGO. 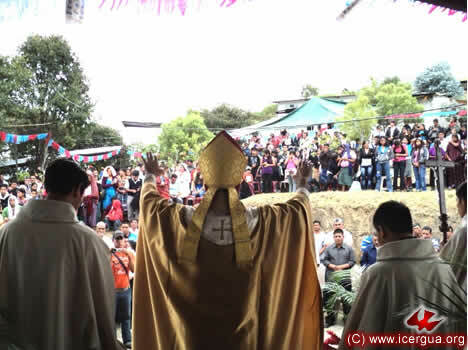 In the evening of October 23, the bishop presided at the Eucharistic celebration in the Chinacá Community, Huehuetenango. 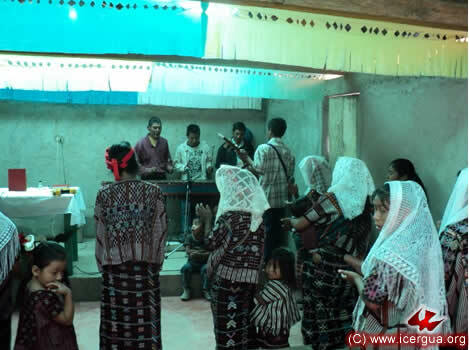 The faithful of this and two other communities from central Huehuetenango and the communities of Chiantla have been working hard to prepare the church’s anniversary, for they have taken on the responsibility of hosting the event. OCTOBER 24. 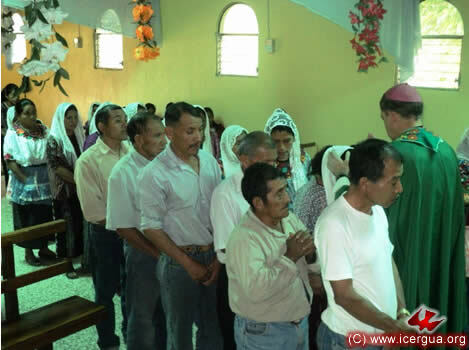 CREATION OF THE “RENOVACIÓN CARISMÁTICA” PARISH OF CHIANTLA, HUEHUETENANGO. 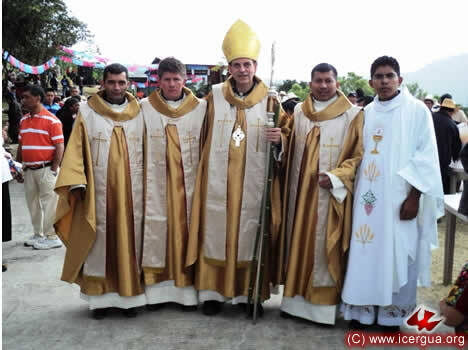 October 24 was marked by a special event in the life of the Renewed Catholic Communities of Chiantla, Huehuetenango. 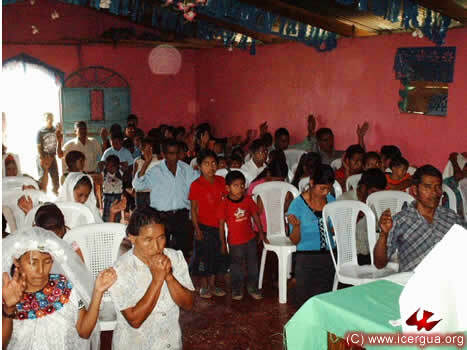 After a long preparatory process, the Renewed Catholic Parish of “Renovación Carismática” was established on this day. Before the celebration of the Eucharist in which our bishop was to proclaim the parish, the communities’ representatives on the Pastoral Council wanted to meet with the bishop to reaffirm their decision and their commitment to make the creation of the parish an important moment in the reaffirmation of their spiritual identity. 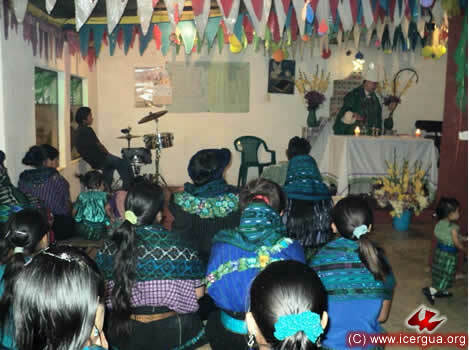 The Renewed Catholic Communities of Chiantla have more than 10,000 members. 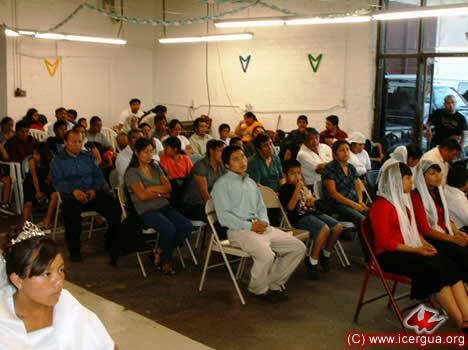 For the event, the church of the village of Capellanía, which will serve as the parish seat, was completely full (only about 60% of those who came were able to fit into the church). An estimated 2500 people, coming from the various communities, were present. 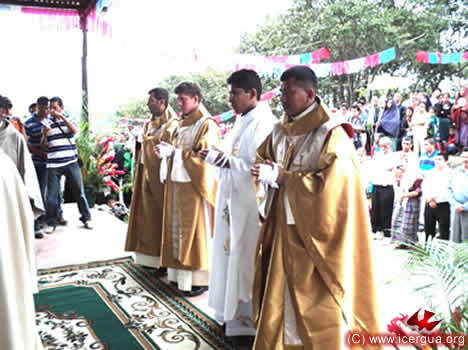 Left: Monsignor Eduardo, having read the decree creating the parish, delivering it to the president of the Pastoral Council, Brother Domingo, who is flanked by other members of the Council. Immediately afterwards the books registering the sacraments in the community were delivered. The books that had been used prior to this point were archived. 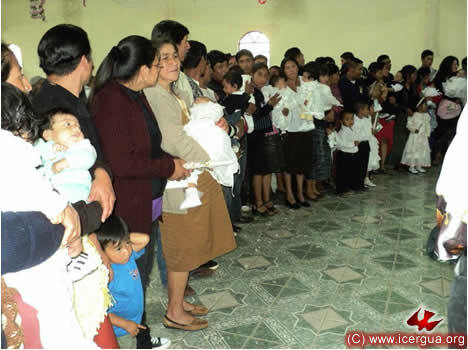 In addition, books were authorized for registering supplementary certificates for those who had received the administration of sacraments before the communities covenanted with ICERGUA and who had not been able to obtain certification of having received these sacraments. To celebrate the birth of the parish, the parents and sponsors had splendidly prepared twenty children who received Christian Initiation on this day. 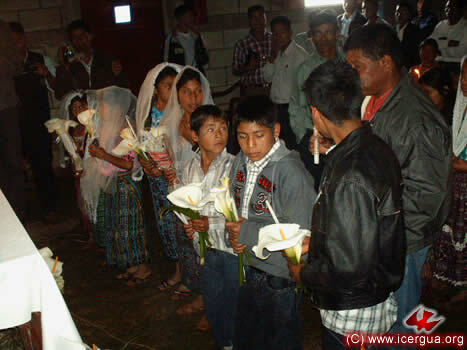 Also a couple wanted their wedding to be celebrated on the same day, thus symbolizing the covenant that the Chiantla communities made with ICERGUA. OCTOBER 24. VISIT TO THE SAN GASPAR IXCHIL COMMUNITY, HUEHUETENANGO. 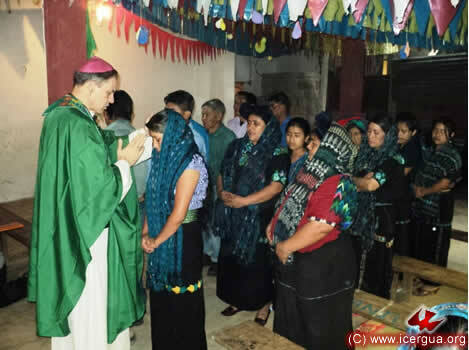 On Sunday afternoon, October 24, our bishop visited the San Gaspar Ixchil Community. His surprise was great, and very gratifying. The last visit had been in April. At that time, the celebration took place in the hallway of a home of the member who coordinates the community. Now, thanks to much effort and great blessing, the faithful have built the walls, the roof, windows and door of a beautiful and spacious church. In addition the number of members in the community has grown significantly. The Lord is blessing the faith and efforts of those who trust in Him. Above: The bishop administering the Absolution of sin for those who have confessed. 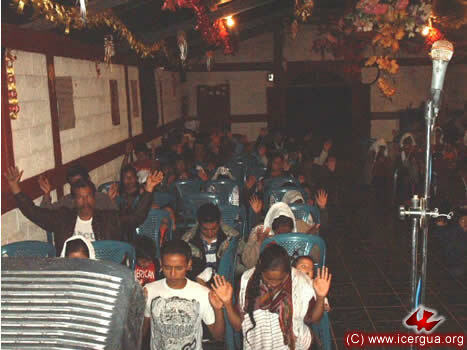 Right: Prayer during the celebration, during which a marriage took place and numerous children received Christian Initiation, including the children of the couple that married. OCTOBER 29. 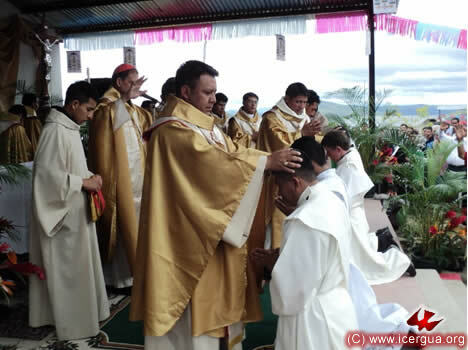 ANNIVERSARY OF ICERGUA AND PRESBYTERIAL ORDINATIONS. Although the exact day of the church’s anniversary is October 27, commemorating the day on which it received Apostolic Succession and was constituted as a Local Church, the celebration was held on Friday, the twenty-ninth, for practical reasons. It took place, as is becoming the tradition, in the Huehuetenango Education Center. In spite of transportation difficulties, about 5000 of the faithful were present, coming mostly from neighboring areas, although all the parishes and all the regions were represented. The culmination of the celebration was the ordination of four deacons as presbyters. The four new presbyters are: Marco Tulio Calderón, originally from Sonsonte, El Salvador; José Armando Hernández, from Chalatenango, El Salvador; Denis López Obando, from El Paraíso, Honduras; and Pedro Martínez, from Zacatecoluca, El Salvador. After the many years of formative education and the exercise of ministry first as seminarians and then as deacons in various communities, the leaders of the communities which they had been ministering presented them and testified to their suitability for the ministry and formally requested their presbyterial ordination. Above: Deacon Denis López making his commitment of fellowship, collaboration and fidelity in serving our church. 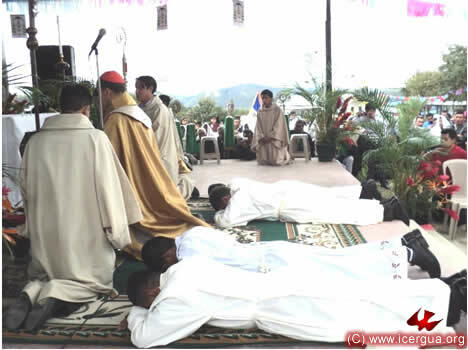 Left: The four deacons are prostrate on the ground while the People of God are on their knees in prayer, asking the presence of the Lord and the outpouring of the Holy Spirit that the four candidates be consecrated as Presbyters. One of the central moments of the ordination rite is the laying on of hands by the bishop followed by the epiclesis and consecrating prayer. 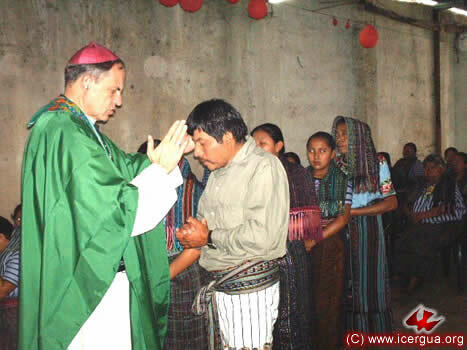 Right: The bishop laying hands upon Deacon José Armando Hernández. 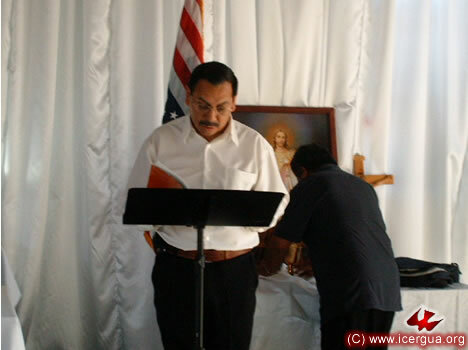 Then he was to do the same for Deacon Marco Tulio Calderón. 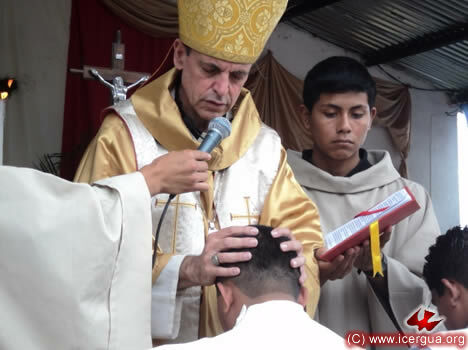 Left: The bishop at the laying on of hands for Deacon Denis López Obando. 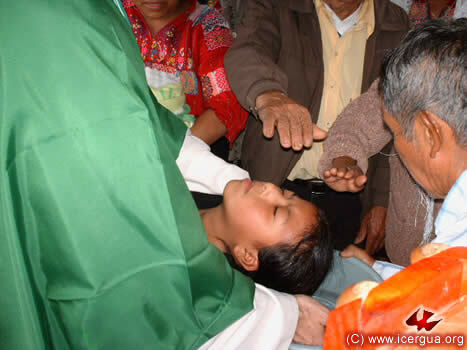 The bishop at the laying on of hands for Deacon Pedro Martínez. When the bishop ended the ritual of the laying on of hands, all the presbyters present came to lay their hands also on each of the ordinands, signifying the collegiality of the ordained ministry and the reception of the new ministers into the order of presbyters. The consecratory prayer having ended and the ordinands now being priests, they were dressed in the vestments proper to their ministry—the stole and the chasuble. Then the bishop, again following the prescription of the Old Latin Rite, anointed their hands with the oil of the catechumens, whereupon their hands were bandaged, symbolizing that they belong completely to God by the anointing of the Holy Spirit, their death to the world, and their works of faith. After the ritual of ordination, the families and sponsors of the new presbyters came to pray over them and to give their blessing, asking the Lord that the presbyters may exercise their ministry with diligence and holiness of life. José Armando was accompanied by his parents and a close companion who came from Chalatenango; Marco Tulio by one of his brothers; Denis by his mother; and Pedro by one of his brothers. There followed the offertory. 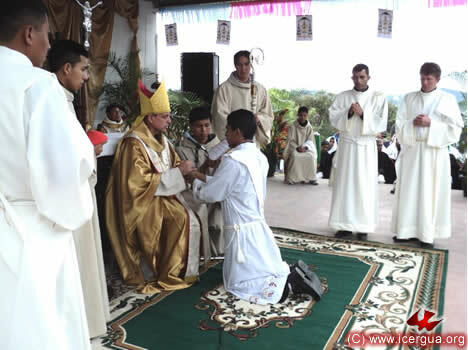 In the photograph at left: after the Eucharistic prayer, Father Rigoberto, Dean and Vice-General, and Father Francisco, Vice-Dean and Pro-Vicar General, elevate the cup and paten. 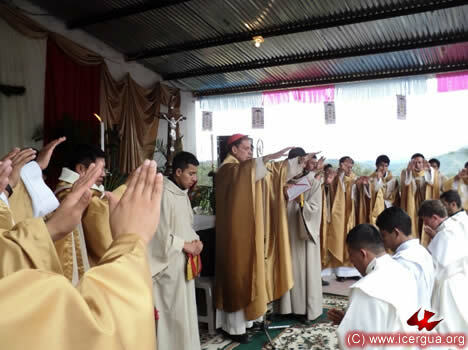 Before the final benediction was delivered, diplomas were presented to the faithful who had concluded a course of formative instruction in ESTYMLA in Huehuetenango. Eight received the diploma in Basic Theology and six in Catechesis and Liturgy. 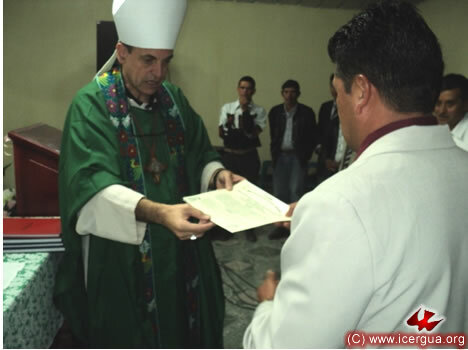 Right: The bishop delivering the diploma to Brother Juan Mateo from Santa Eulalia, Huehuetenango. At the side of the bishop is the new presbyter, Pedro Martínez, who this year served as Academic Coordinator for ESTYMLA, Huehuetenango. 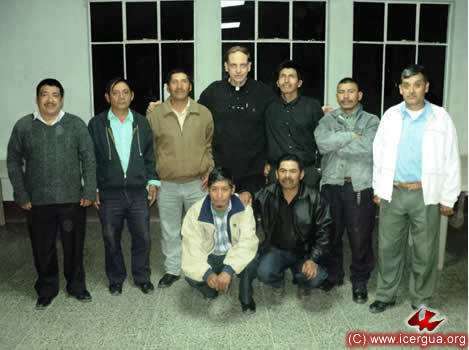 At time of giving acknowledgements and thanks, the Indigenous Mayor of San Juan Comalapa, Chimaltenango, was invited to offer thanks on behalf of the Ancestral Authorities of the nation for the pastoral work that ICERGUA carries out in the indigenous towns. He took advantage of the occasion to exhort all who were present to be aware of their responsibility to work tirelessly for the dignity and promotion of the villages and the indigenous cultures. Left: The mayor addressing the audience in the Kakchiquel language. Behind him is the translator who repeated the message in Spanish. Right: The bishop along with all the presbyters imparting the benediction to the whole People of God. It was truly a day of blessing and deep joy, from the devotion and active participation of the whole People of God to the pleasant weather that allowed everyone to maintain an attitude of devotion during the entire three hours of the celebration. 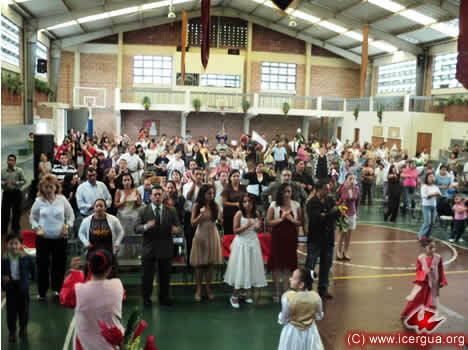 The celebration was possible thanks to God’s blessing and the participation of all the People of God. However, there were also certain persons and communities who were directly involved and helped with sacrificial generosity. Special gratitude is due to them. Brother Mynor of the Huehuetenango Community was in charge of organizing the logistics of the event. 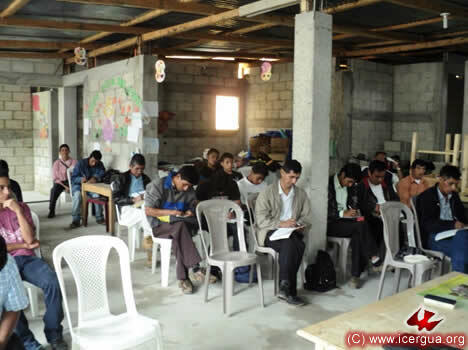 He along with all the communities of the municipality of Huehuetenango and Chiantla were responsible for preparing meals, coordinating the organization and finding means of financing the expenses of those involved. The bishop’s sister, Ileana de Novales, and her husband, Dr. Emilio Novales, financed and set up the floral and other decorations for the event. Our church feels grateful for their efforts and generosity. Right: Our bishop flanked by the new presbyters. From left to right they are José Armando Hernández, Marco Tulio Calderón, Pedro Martínez and Denis López Obando. OCTOBER 30. DEANERY OF JACALTENANGO, HUEHUETENANGO. 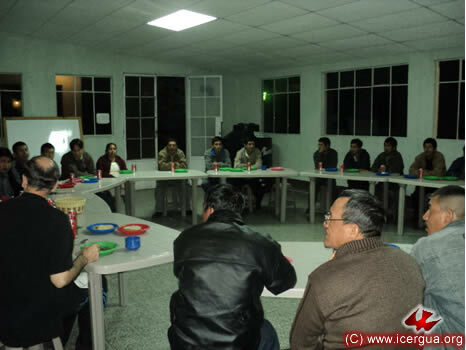 On Saturday morning, October 30, the meeting of the Deanery of Jacaltenango and the Huistas took place. Delegates from all the communities were present, and gave enthusiastic reports on the successes of recent months. They were eager for the formative instruction that Monsignor Eduardo gave on the fundamentals of the mission that the Lord has entrusted to us. This is the same theme that had been explored during the meeting of the Presbyters. Above and right: The second part of the Deanery. The first part consisted of presentations on the state of affairs throughout the deanery from community representatives, councils and the presbytery. After that, the bishop made comments regarding what has been planned, answered questions, and shared viewpoints. Then the second part began, focusing on the formative themes. OCTOBER 30. VISIT TO THE BUXUP COMMUNITY, JACALTENANGO, HUEHUETENANGO. 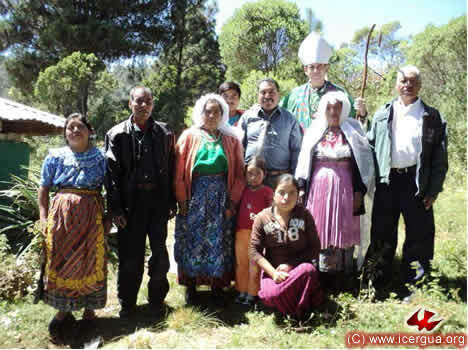 In the afternoon, with solemnity and careful preparation, Monsignor Eduardo made a pastoral visit to the Buxup Community, a village in Jacaltenango. This community recently joined our church. Its members are excited and eager to commit themselves actively to learning and to evangelism while maintaining their own spiritual identity. 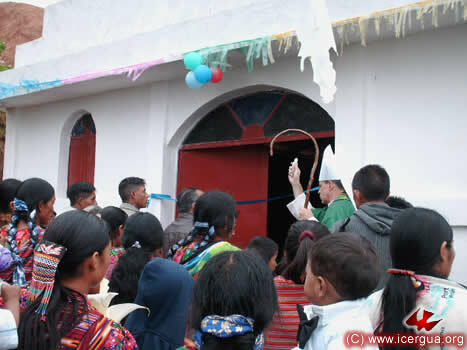 Above: The bishop was met at the entrance to the village by Father Santos Acosta Sol, responsible for the pastoral work in this area, and by representatives of the People of God. From there it was a short walk to the center of the village, where Eucharist was celebrated. During the Eucharist, Chrismal Confirmation was celebrated for several young people. Among those at the Mass was the Municipal Mayor. At right: the celebration of the Mass. Left: The People of God preparing to receive Absolution for their sins, having confessed themselves to be sinners and having expressed their sincere repentance. Right: Invoking the Holy Spirit on those who were to be confirmed before anointing them with the Holy Chrism. Left: Having thanked Father Santos Acosta Sol and the community leaders, the bishop is pronouncing the benediction. OCTOBER 30. 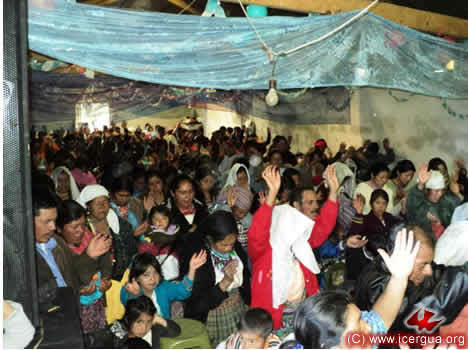 EUCHARIST WITH THE JACALTENANGO COMMUNITY, HUEHUETENANGO. 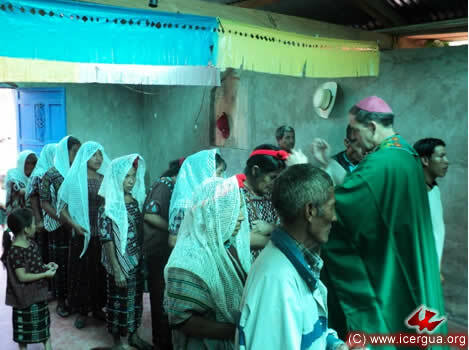 On the evening of October 30, the bishop visited the community of central Jacaltenango, Huehuetenango. He celebrated the Eucharist and administered the sacrament of Confirmation to brothers and sisters who had been very well prepared. This community has experienced sustained growth throughout the past year. It radiates joy and enthusiasm and shows its eagerness to commitment itself to evangelism more and more deeply. OCTOBER 31. 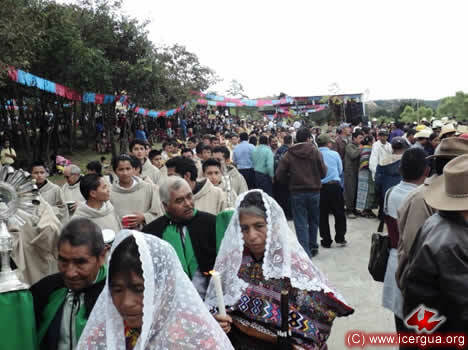 ANNIVERSARY OF THE APOSTOLATE OF MARÍA IN THE LA ANUNCIACIÓN PARISH, GUATEMALA. Our bishop’s pastoral activities for the month ended with the celebration of the Eucharist with the members of the Renewed Catholic Parish of La Anunciación—Catholic Apostolate of María, Guatemala City. They were celebrating their anniversary and the end of a forty-day fast. The community has had some difficulties, but as Brother Manlio Escobar, the community coordinator, said, they all have confidence that the winter is over and spring is on the way.